This has been a good week for me and photography – I feel creative…I feel inspired…I feel really good. I even managed to get ahead of myself this week which is pretty awesome (and necessary considering that the holidays are quickly approaching). Anyways, it’s that time again…Scavenger Hunt Sunday. So, if you’ve been participating in the Scavenger Hunt each week, I hope this week’s items inspired you. If you’re new to the Scavenger Hunt…WELCOME! The other day, I teased you with a “special delivery” from The Paper Mama! 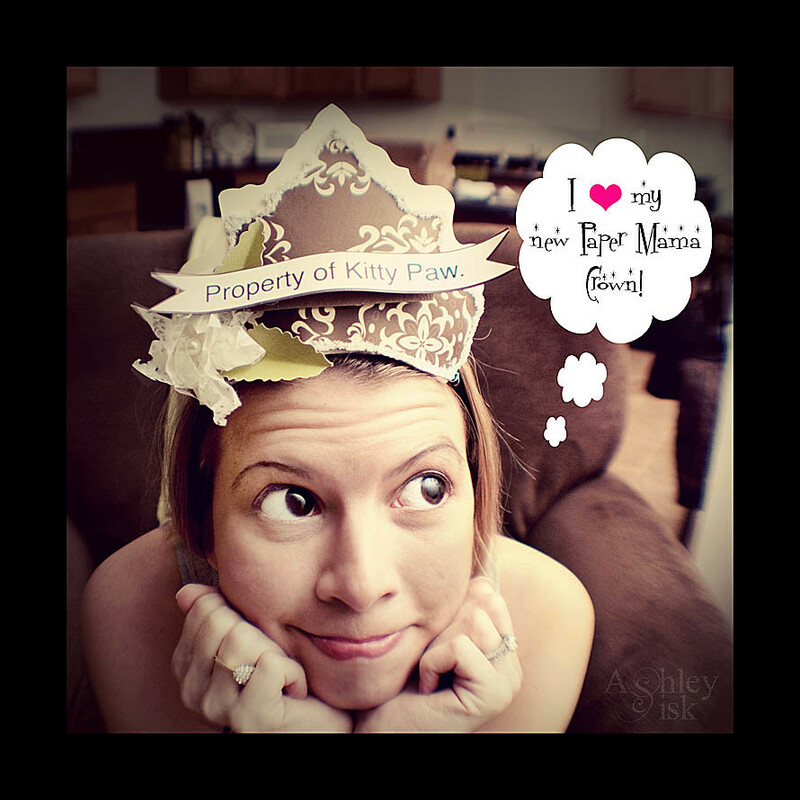 Well, as you can see in the picture above, she sent me my very own Paper Lady Crown with inter-changeable titles (including Property of Kitty Paw, Photo Nerd, Shhhh…I’m Blogging, etc). I love it! So…the other night, I wanted to show off my new crown and take a self-portrait for this week’s challenge. I also wanted to try a photoshop technique inspired by Captivus. She will be launching a new challenge on November 18th designed to challenge all of us using Photoshop or Photoshop Elements. This week’s prompt is “liquify.” As you can see, I used this tool (found under FILTER>DISTORT for PSE users) on my eyes and lips to create a cartoon look for myself. I think it’s pretty fun and I’m looking forward to playing with this tool a little more. If you want your own Paper Lady Crown, click HERE. The photo above is the result of an arts-n-crafts project my mom and I tried the other weekend. For our wedding last year, one of our family friends made a very similar S. Unfortunately, it broke so we were unable to use the original for this holiday season. 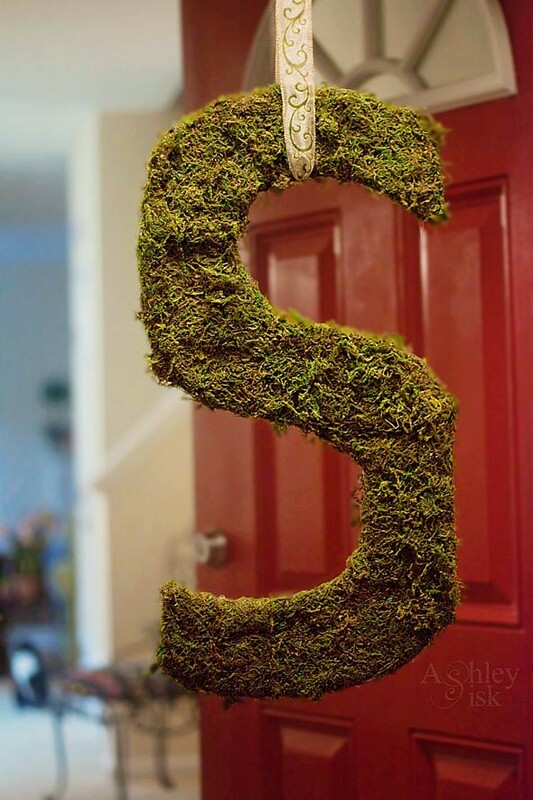 Luckily, we’re pretty crafty, so we were able to recreate the “S” wreath. I am not a step-by-step craft project photographer, so I have no photos of the process. Materials: One sheet of large Styrofoam board (we used a really thin piece, you could also use a piece of left over cardboard), one package of sheet moss (you’ll want it on a sheet vs loose moss), some sort of adhesive (we used a hot glue gun, but spray-on adhesive might be less time consuming), a knife, scissors, decorative ribbon and patience. Fold over the extra moss around the edges as if you’re filling in the seam. 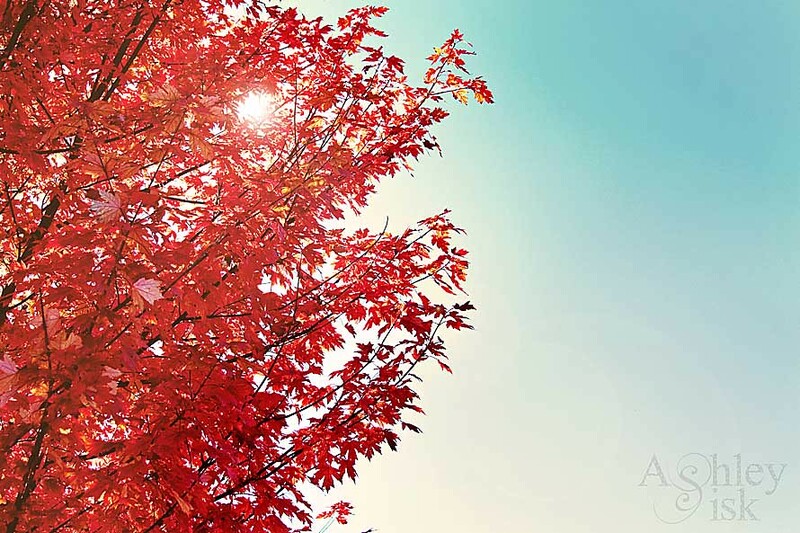 I love love love this beautiful autumn red-orange color. I was running a few errands when I saw this tree and how the sun was hitting it just right. 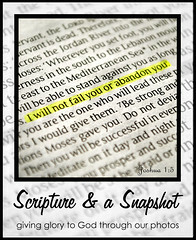 It took me so long to start participating in Katie Lloyd’s Scripture and a Snapshot, but now that I’m officially participating, I am really enjoying finding scriptures to support one of my Scavenger Hunt Photos. 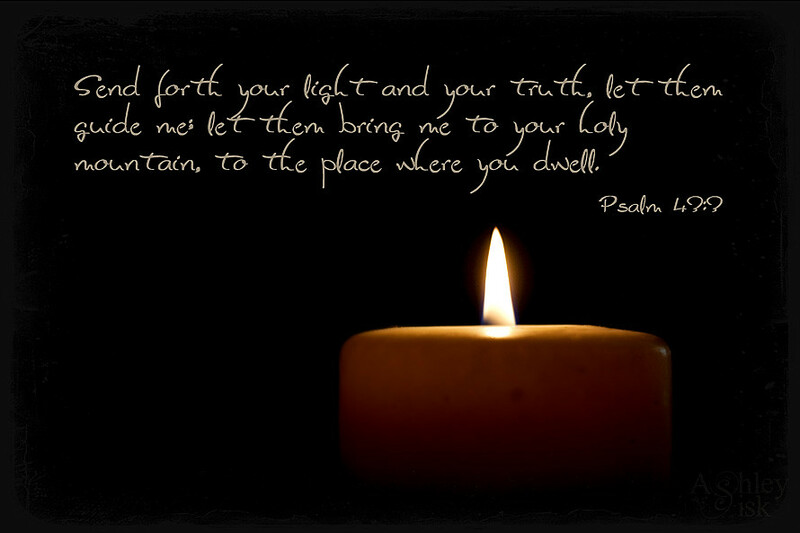 This particular scripture comes from Psalm 43:3 (the font is difficult to read). 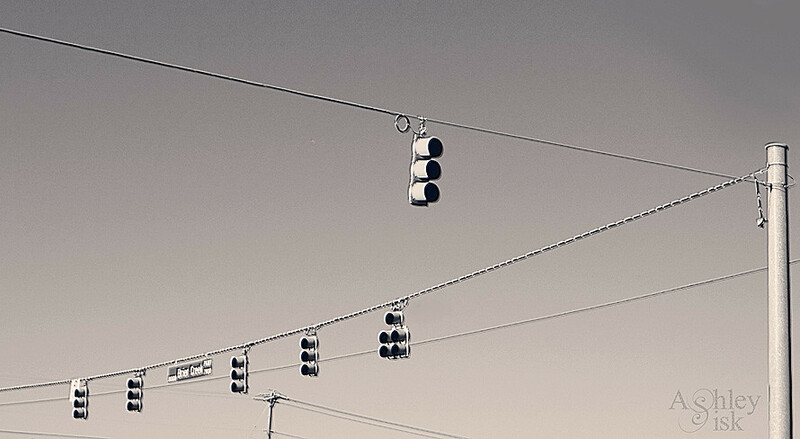 I really struggled with getting what I thought was an interesting shot of traffic signals or signs…until I played with my post-processing. For this particular shot, I used My Four Hens – Slick and then applied an emboss layer which made the signals pop. A big THANK YOU goes out to Chelsey and Mandy since they helped me finish out the Scavenger Hunt list this week. They actually suggested that I start to incorporate YOUR prompts as part of the hunt (which is great, because I’m starting to run out of ideas). I have traditionally used one item from another list (this group has moved away from the blog world…and this next theme was “brown,” so I thought that had been overplayed), two items from the Photo Hunt challenge of the month and then two other random items. With that said, send me your ideas. Each week, I will select one reader’s prompt list, add those items to what is currently on tap, and give the selected reader a shout out on my blog during Scavenger Hunt Sunday. So, off you go…happy shooting!